If a marriage proposal is in your future, you may find yourself starting to think about that perfect engagement ring- the one that fits your personality and style just so. Whether you are the one who will be popping the big question or the one who will be saying yes, choosing the right engagement ring design is an important step. An engagement ring is a powerful symbol of love, commitment, and devotion; a piece worn for a lifetime and genuinely loved by its wearer. With so many engagement ring designs to choose from, it can be difficult to know where to start. Celebrity ring designs can serve as a great source of inspiration, especially for those interested in creating a custom-designed ring. From the classic diamond solitaire to eclectic, fashion-forward looks, there is no shortage of designs to discover among the latest celebrity engagement ring trends. Inspired by the likes of Meghan Markle, Duchess of Sussex, stacked bridal sets are quickly becoming one of the hottest celebrity engagement ring trends to hit the jewelry world. Rather than wearing the traditional two-ring bridal set, more brides are opting to stack bands that complement one another in creative ways. If you or your future bride is interested in this style, creating a set of custom bands can be the perfect way to achieve a modern and stylish look. Recent years have seen brides moving away from the classic round brilliant cut diamond and toward shapes with elongated lines like the oval or the radiant cut diamond. Fashionable celebrities like Blake Lively and Hailey Baldwin sport oval-cut diamond rings, catching the eyes of fans everywhere. Oval diamonds are a flattering option because they can create the illusion of a larger diamond and elongated, graceful fingers. Forget sticking with one metal or gem type¾ today’s celebrity brides are expressing their unique styles with mixed metals and varied gemstones. Duchess of Cambridge Kate Middleton wears a famously unconventional ring that features a large oval sapphire surrounded by a halo of gorgeous diamonds. Though her ring was passed down from the late Princess Diana, you can create a modern version of it by mixing small surrounding diamonds with a large, vibrant gemstone of your choice. Or, consider switching it up by combining two or more types of metals, like white and rose gold, for a striking and high-contrast look. 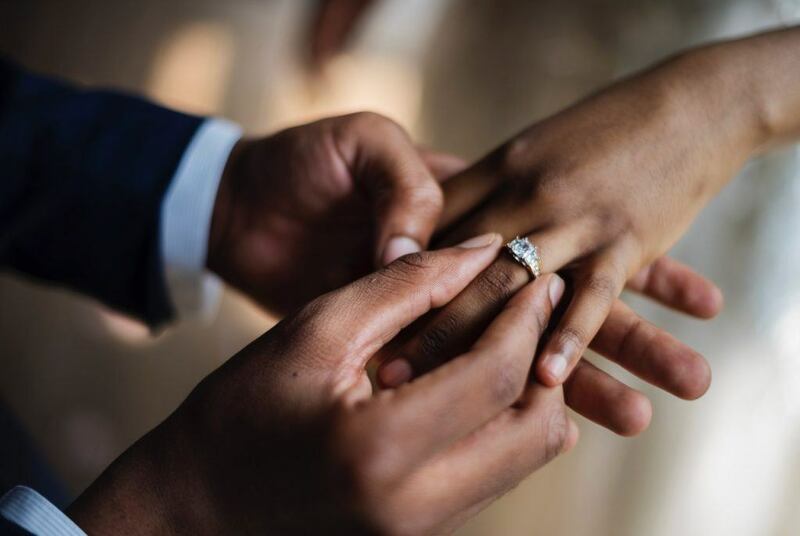 Seeing celebrities with stunningly large diamond rings is nothing new, but now this trend has caught on with everyday brides. Among the stars with head-turning stones are Paris Hilton and Hailey Baldwin, with their gems measuring anywhere between ten and twenty carats. While your engagement ring budget may not allow for a twenty-carat stunner, you can still use this as inspiration by emphasizing the size of the center stone with various aesthetic techniques¾ones that our designers are experts at implementing. For example, consider pairing a single, large diamond and a slim delicate band. Exaggerating the ratio between the width of a generously-sized stone (particularly one of high quality) and that of an ultra-minimal band tends to highlight the size of the diamond and draws the eye to the stone’s gorgeous sparkle and shine. Every marriage begins with an exciting first step: the proposal. Let Dominion Jewelers help make your engagement unforgettable with a beautiful, custom made engagement ring that follows the hottest celebrity engagement ring trends. Our collection of heirloom-style engagement rings boasts generous selection and variety and our designs range from traditional and understated, to unconventional and attention-grabbing. If you want to create something that is one-of-a-kind, Dominion Jewelers can guide you through the custom design process. Our expert designers will work closely with you to bring your vision to life, whether you’re hoping to build a ring with classic features or one with a modern, trendy look. Together, we can make your engagement ring dreams a reality. Contact Dominion Jewelers today to learn more about how we can blend your inspiration and the latest trends to design the perfect engagement ring for you.